Let’s leave Clifford’s Tower and dash across to nearby Piccadilly, to the site of the old Reynard’s garage/Airspeed building, pictured above earlier this year. It has been looking a bit empty and boring since the demolition of that building. Nothing had been planned to replace it, and I thought we might end up with a buddleia forest, as on so many other empty ‘brownfield’ sites. 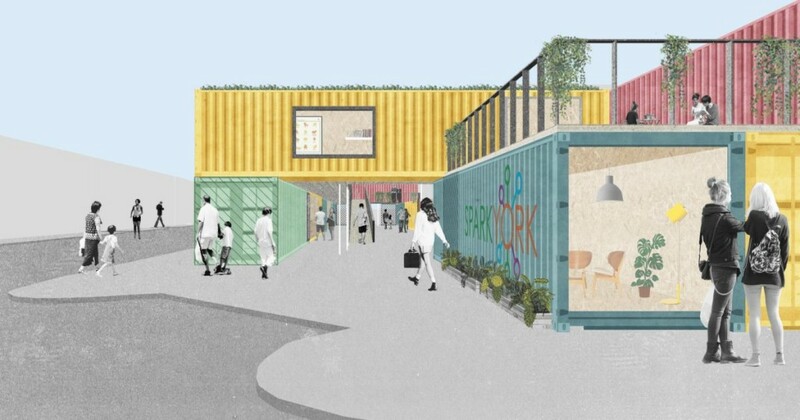 But last week local media reported ‘Bold new street food plan for York eyesore site‘ (York Press) and ‘Shops and street food – inside shipping containers! Bold plan for York city centre revealed‘ (York Mix). I was at the computer doing something tedious and boring when this news story appeared, and it seemed to brighten a dull November afternoon. ‘Wow’ was my initial reaction. Personally I’m not offended by the idea of shipping containers, or any other ‘ugly’ and functional thing on this particular site in Piccadilly. The plan is for a temporary construction, on an empty site, and therefore involves no obvious harm. In fact it seems like a fairly good fit to the spirit of the place. Piccadilly’s not an ancient York street, it’s relatively new, this bit being an early 20th century construction. It was made to serve the needs of the early 20th century and now needs to fit with the early 21st century. This part of York, in the Fossgate/Walmgate/Piccadilly area has changed in many ways in the time I’ve been doing this website, both culturally and in terms of its built environment — almost unrecognisable in parts of nearby Walmgate. The same as many ‘York born and bred’ people of a certain age I can’t help but have mixed feelings about all these changes, because there’s a certain amount of loss involved. But I can’t see that anything will be lost in this proposed plan, apart from perhaps a loss of light to some of the nearby properties. But not half as much as when the inevitable tall building appears on the site, at some point in the future. This isn’t the first mention of the possible use of shipping containers as temporary accommodation for start-ups. A document prepared as part of the UNESCO City of Media Arts bid (PDF on this link) includes a reference to ‘stripped and refitted shipping containers on a 99-year lease’ as part of the York Central development. Also, Googling revealed that Goole got some in 2010, they’re perhaps still there. Having been a student in York for three years, I feel that there’s a need for more social cohesion, namely between the student community and local residents. … Students already contribute great things to York; young talent, creativity and investment but this needs to be harnessed more through a project such as the one proposed. Grace isn’t alone in feeling that there’s a need for more social cohesion. 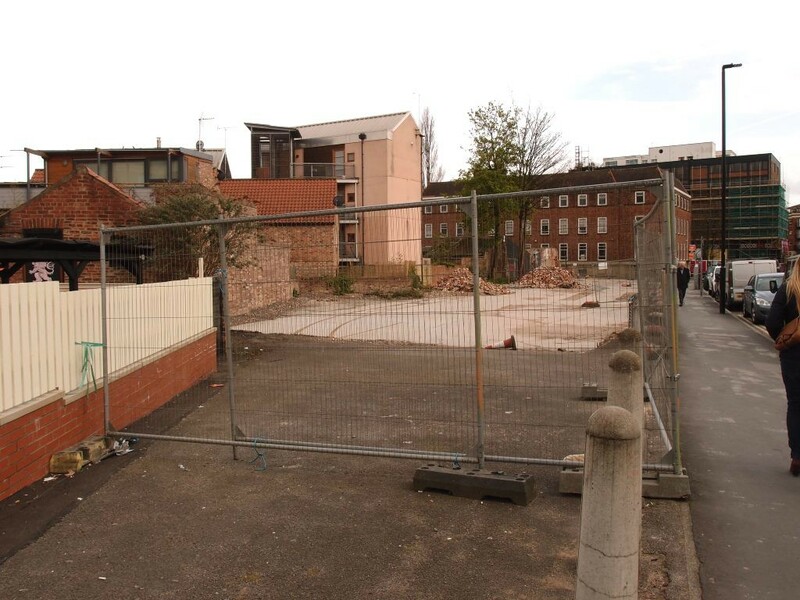 To hope that this or any project could bridge what appears to be a growing divide between the student communities and local resident communities is perhaps to expect too much, but surely it’s better that the site is used, as soon as possible, and personally I admire the boldness of it. And can’t see, on what I’ve read, any grounds to object to putting functional temporary structures on an unused piece of land in Piccadilly. It’s a packed agenda with many things of interest, one in particular of great interest to me. Should be an interesting meeting to watch on the webcast. Since this page was written a planning application has been submitted. More info on this link.